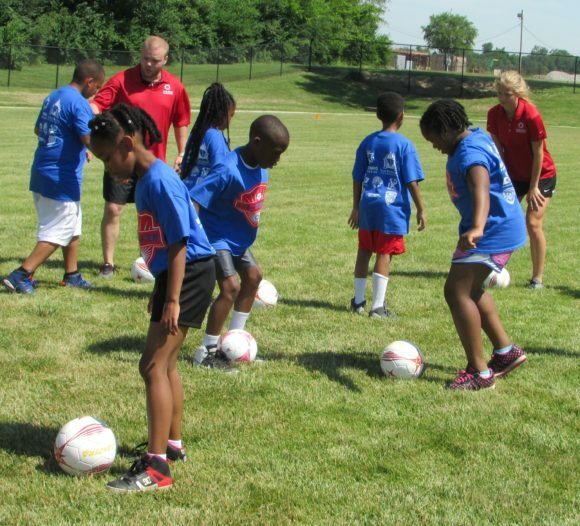 The temperature was in the nineties but that didn’t stop the youth soccer players and trainers from having fun and honing their skills at the JJK Soccer Clinic sponsored by the Bob Emig Foundation on June 11, 2016 at the Jackie Joyner-Kersee (JJK) Center. The Bob Emig Foundation is named for the late Bob Emig, an area sportswriter and a leader in developing youth through participation in sports. In line with his passion, the foundation focuses on “Inspiring Youth Athletes…Transforming Lives” by providing youth opportunities to enjoy the benefits of a healthy sports experience.